SoBou is thrilled to welcome world traveler and cocktail enthusiast Amanda Thomas to the bar as our new Bar Chef! Before moving to the city she now calls home since 2009, Amanda spent several years traveling around the United States and Europe. Her goal was simply to study regional culinary traditions, local spirits and the different ways people imbibe, making her an expert in cocktail culture. Amanda Grew up in the New Haven, Connecticut area. Her Mother hails from Puglia, as did her grandmother Vincenza, who really inspired Amanda’s love of the kitchen from a young age. Her “Nonni” was a stay-at-home mom who kept busy - whether she was cooking, knitting or gardening, she taught Amanda the importance of doing everything thoroughly and with joy. It’s this piece of wisdom that has helped shape Amanda’s career throughout her life. Amanda received her formal education from the Apicius International School of Hospitality in Florence, Italy, where she earned a certificate in food communications and publishing. “I always loved food anthropology. I loved the movies Indiana Jones - I wanted to BE Indiana Jones - and Cocktail, so I morphed those two together to create a career about adventure, cocktails and food,” shared Amanda. In 2016, she took home the award for best cocktail in the U.S. at the Pink your Drink cocktail competition and then flew to Stockholm for the finals. 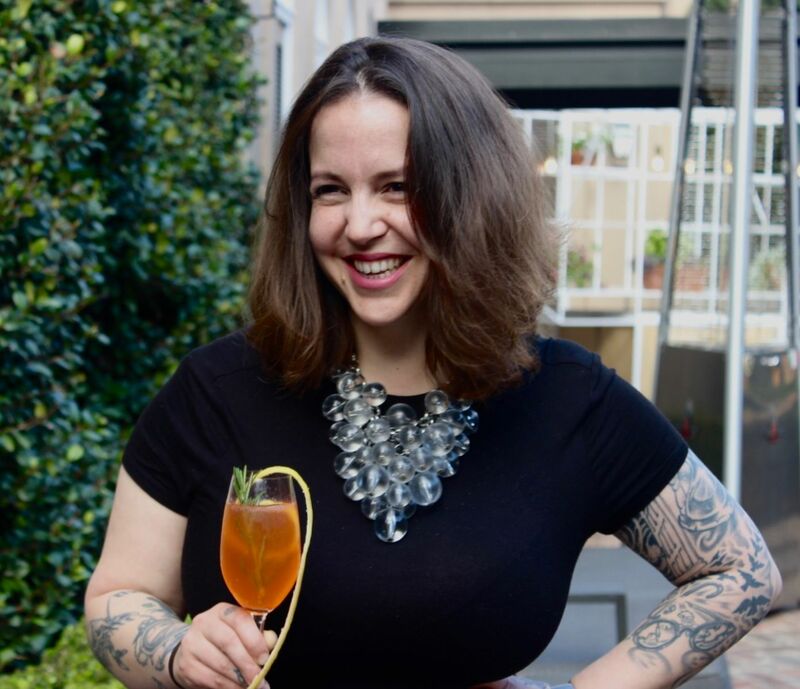 During her first few years in NOLA, Amanda worked at Revel, where the “Godfather of the NOLA cocktail industry,” Chris McMillan and his wife Laura became her mentors. Chris taught her the importance of balance and the build of a cocktail, while Laura helped her understand the delicate beauty of building rapport with everyone who walked through the door. After two years at Revel, Amanda moved on to join the team at Apolline, where she had complete control over the bar before moving on to join the SoBou family. Ready to harness all her creativity, Amanda has embraced SoBou’s cocktail-centric style. With Amanda behind the bar at SoBou, New Orleans can look forward to an education in sustainability for cocktails. She wants to open her guests’ eyes to the way cocktail ingredients can potentially serve our bodies, like using fresh basil in tea, which can help headache tension. SoBou Bar Chef Amanda plans to bring sustainability in cocktails to the forefront, using her tips and tricks from years of travel and cocktail education. Edible cocktail umbrellas, anyone?